Getting started: How do I help? Your involvement can be in many forms but the most common and most discussed is through being a leader. While “leader” might sound like a hefty job, it’s really not! Let me tell you about what we do here at Cookies for a Cop and what it means for you to be involved as a leader. Cookies for a Cop (not to be confused with Cookies for Cops) takes steps to make sure that every single officer is appreciated as an individual as well as an important part of the department as a whole. We are not randomly dropping off random amounts of cookies. 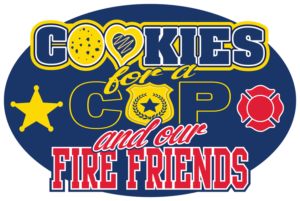 Our mission is specific, detailed, and organized with the delivery of two (2) cookies for every one person – sworn officers and their civilian support staff (and now firefighters too!) at a given location. While our name specifically states cookies, any quick to grab, non-messy treat is acceptable! This would include brownies, chocolate covered pretzels, Rice Krispie treats, etc. Cakes and cupcakes are strongly discouraged. That’s right! For the 2016 campaign (and beyond), we will include our heroes in red as well. It only seems like a natural fit and since our founder has roots from the fire side with family now on both sides of this coin, it’s a bonus for all. This addition has already been met with great excitement. Call their department and introduce themselves and our campaign. Invite them to check out our website and ask the department if they would be accepting of such a campaign for their men and women. Gather numbers of sworn officers, civilian support staff, firefighters, etc that will be served. Recruit TRUSTED family and friends to help bake / purchase / package if your area has numbers that surpass what you can cover yourself without losing your sanity. NEVER accept edibles from someone you don’t personally know and trust. Take photos (and/or videos) and post online and share on our page. Hashtag everything you post #sweetkindness. Note that this and more can be found in the Leader Kitchen with access granted upon approval. Safety is job #1, showing appreciation, #2. We want to make sure our law enforcement and fire communities are safe. Period. Because of this, not everyone who applies will be granted approval. I apologize in advance, but there are going to be times this is the case if we can’t find a way to get through the approval process. This is not that you are unfit for this campaign, it is a safety thing and nothing more. Approval comes in one of a few ways with my favorite method being emails from personal contacts in the LE / FF community who can vouch for a specific source. These emails MUST come from an official work email address. I never reply to emails sent as I understand work email is for work – not cookie chatter. Starting with deliveries in 2015, ALL leaders MUST present identification with all deliveries. It is preferred that leaders leave a copy of their ID with the departments they serve. These departments can then verify if that name shows on our leader list and contact me should they wish for more detailed information. If at anytime a department does not feel comfortable with a delivery, by all means, throw it out. At no point do we want to put anyone’s health or well being in jeopardy. The plus to our process is that many times, departments will know the source OR have direct access to a contact of that source from a neighboring department. All deliveries must also have a Cookies for a Cop tag (these will be sent to each leader individually as we get closer). More to come on tags soon. (Please check back). SOUND LIKE A PROJECT YOU’D LIKE TO JOIN? To date (including our upcoming 2018 delivery, we have delivered / will deliver a combined total of over 500,000 cookies! If you feel that you are a good fit and would like to apply for a leadership position to make sure the men and women in your area are covered, reach out! Fill out our LEADER FORM HERE and list the departments you’d like to cover (if approved). I will be in contact shortly after and we will get the process started. An act of kindness become a huge statement when multiplied hundreds of thousands of times! Let’s make this a statement that is heard around the country!